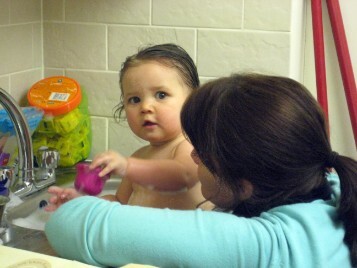 When sarah became too big for the tummy tub, we didn't move very far as the next 6 months' or so of bathing took place in the sink in the laundry. Again, it was great for both James and I as we remained close to the family's activities in the evening and it often meant that one of us prepared for bath time while the other cleared down from the evening meal. If I was bathing Sarah, I would carry her only my lap in to the laundry and then lifted her in. As she got bigger, requiring a higher lift, this was made easier if I put my left elbow on the work surface while lifting her (acting as a lever). To begin with, there were occasions when Sarah would slip about a bit due to the soapy water. To prevent that, we placed a flannel in the bottom of the sink. Bathing was at perfect height for me really. No bending down or stretching across and my eye level was similar to hers so it allowed for a great deal of interaction. We would whisper to each other, sing songs and she would lean across and kiss me. 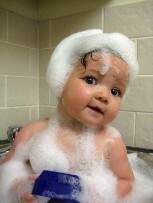 Sarah played happily with the bubbles, 'duckie', word tiles, a wooden peg and cups. Getting out involved lifting Sarah on to my lap which had a towel on it. Once she was wrapped up and dry, I put her nappy and babygro on while she lay across my lap. The key was having everything prepared and within reach before putting her in the bath. Soap, towels, nappy, PJ's etc.